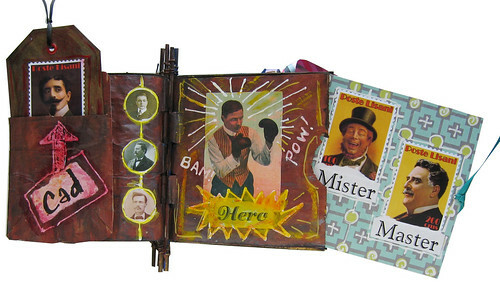 Make It Mondays - Going Postal! Make It Mondays - Love! I made this Purple Postage ATC for this week's Make It Mondays theme "Postage Stamps" using images from the Ten Two Studios Little Purple Things collage sheet embellished with a purple Crayola spider-writer pen (now discontinued *wah*). 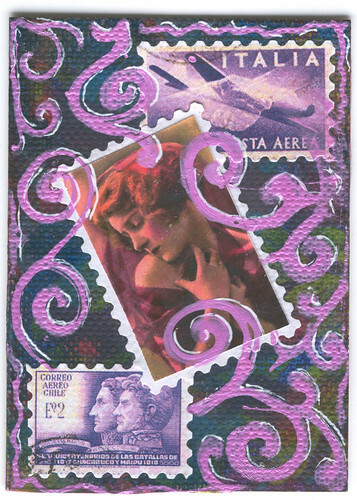 I almost called this "Purple Haze" but "Purple Postage" was more alliterative! 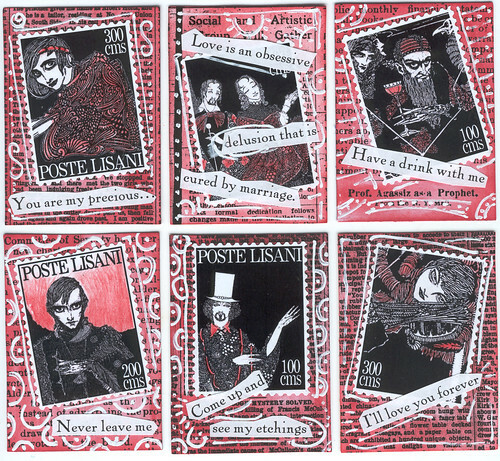 I love using postage stamps in my art. There's a whole Flickr group for that called Postage Stamp It! Art. 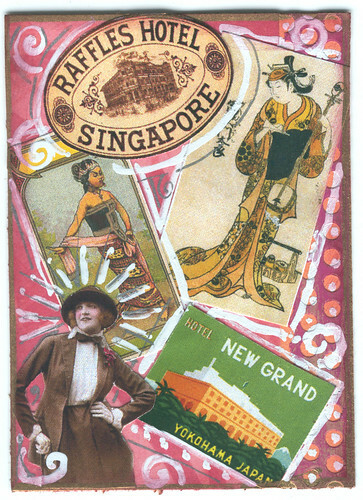 Answer: Artist Trading Cards for this month's Milwaukee ATC live trade theme! 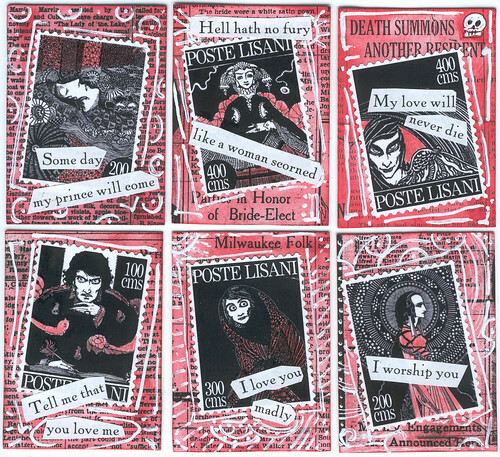 But since I tend to turn every holiday into Halloween, the cards I made this week gave up any notion of romance, and just stuck with vaguely sinister. 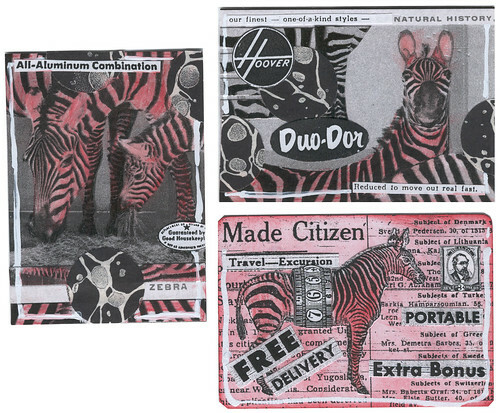 The black backgrounds are the ATC-sized scraps of painted envelope leftover from the ATC display, and I stamped them with white chalk ink and collaged some images I had left from the Black & White Microscope Slide sheet. I didn't think the white stamping stood out enough so I added more doodles with a white-out marker and white gel pen. 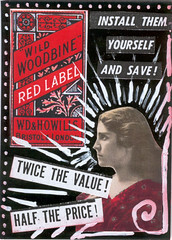 And I played with advertising text combined with images from the Little Red Things collage sheet. 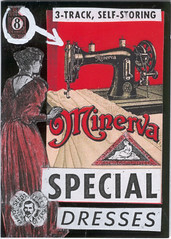 You can see all the black & white & red ATCs on my Flickr. So here's what I've been working on this month. 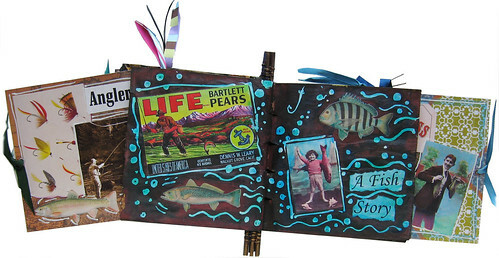 Lisa gave the Ten Two Studios design team the challenge of using one of her paper bag books with a themed collection of collage materials. 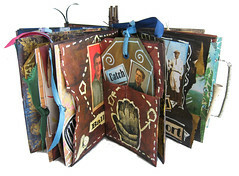 I used the brown piano-hinge book, which is deceptively simple in appearance but has a surprising number of surfaces to decorate! The open ends of the paper bags come with six cardstock inserts (approx. 5" square) and there are also six tags. 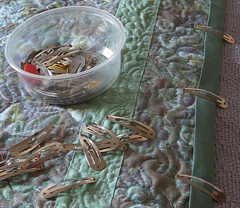 I cut slits in the bottoms flaps of the paper bags to make pockets for the tags. 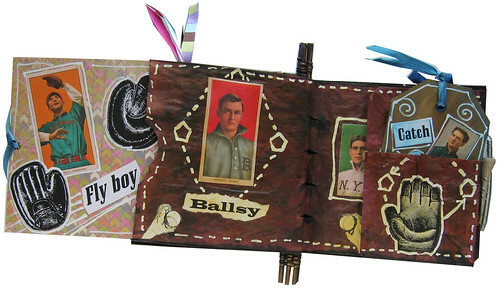 My theme was Men, which for me is a challenge because I tend to use mostly female images in my art work, so I went a bit over the top with The Manly Book of Men, full of masculine words! 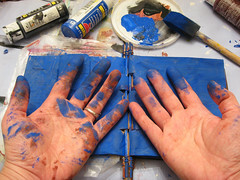 I let my husband chose the initial paint colors, and I applied acrylic paint directly to the paper bags without any gesso. Things got a bit messy but the brown paper was surprisingly sturdy, and although it did get a wee bit wrinkly, it took on a more leathery texture with the layers of paint and application of gel medium for the collage. 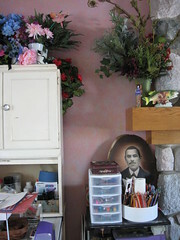 I also had to find manly looking designs in my scrapbook paper stash, which generally favors flowers and pretty colors. I found some browns and blues and geometric shapes. The hardest part was coming up with a list of Manly Words (that wouldn't destroy my "safe" rating on Flickr ;o). You can tell I read and watch too many things set in 19th & early 20th-century Britain. 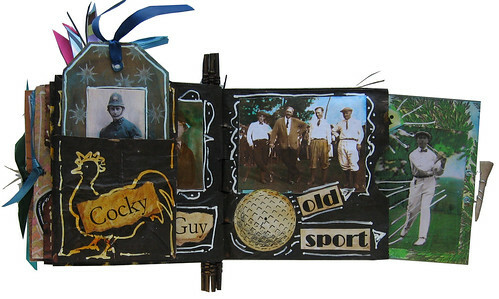 And this is probably the first time I've done book pages on golf, fishing or baseball! 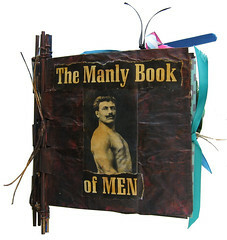 You can see the whole book in my Manly Flickr set. 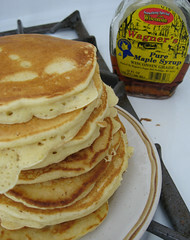 So here's a link to my post from last year featuring my husband's grandmother's chicken-killing pancake recipe! 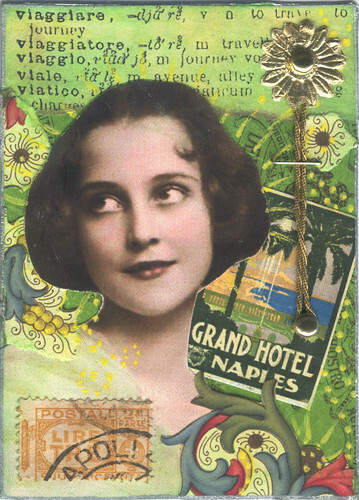 This week's Make It Mondays theme is Travel, and after I made this "Globetrotter" ATC, I realized it was very similar to another ATC "The Italian Tour" that I made last year, also using the vintage travel sticker designs on the Ten Two Studios Little Collage Sheets. Happy Valentine's Day! Fittingly, this week's Make It Mondays theme was Love (and for some reason I keep getting the theme to "Love, American Style" stuck in my head). 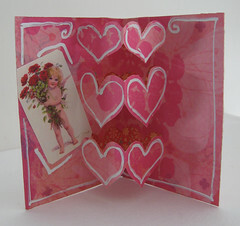 I made some more pop-up Valentine ATCs just because they're so fun to make. 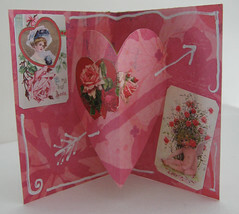 These use images from the Ten Two Studios Little Love collage sheet. And my husband just stuck his head in the door to remind me we're leaving in 15 minutes to have lunch with his mom and son. (We're doing our Valentine's dinner date next week, when the restaurants aren't so crowded.) So toodle-pip, y'all! 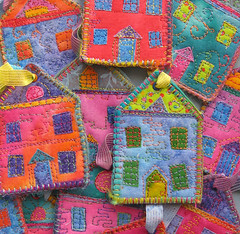 Note: if you're reading this in April 2009 for Fiber Arts Fridays, I'm afraid I had to dip into the archives since I've been so busy I haven't had a chance to work on any new fabric projects! I also wrestled a binding on to my dad's quilt (which he has been given several Christmases in a row with the words "But you have to give it back because it's not finished yet"). I found some excellent instructions for joining the ends at the Dread Pirate Rodgers' quilt site. Now I just have to make and sew on the label. 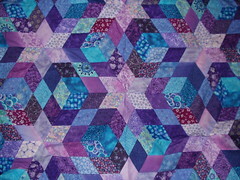 And before Sunday, I really need to baste my purple & blue English paper piecing quilt that's been sitting neglected for two years. Sunday is the annual Daytona 500 party at our friends' house to which I usually bring a craft project to occupy myself while the cars go around in circles. 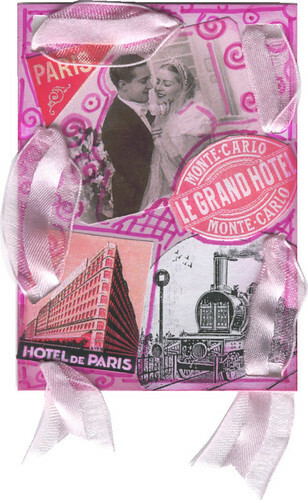 This week's Make It Mondays theme is Pink, so I made this ATC "Pink Honeymoon" using images from the Ten Two Studios Little Pink Things and Little Love collage sheets, which seemed appropriate for February. The ribbon is more pink that it looks in the scan. The train was from a Dover clip art book. 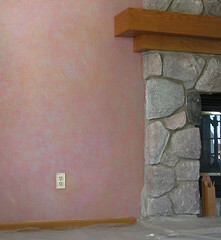 I don't think of pink as being one of my colors, and yet the background for this ATC is a pink paint chip that I picked up when I trying to figure out what to paint the wall around the fireplace in our living room. I finally settled on "Tree Peony" which was a little too flat salmon pink when I finally got it on the wall (and alarmed my husband with its pinkness ;o). So I kept piling other colors (Ash Violet & Sunflower Yellow) on top to see what would happen. I still can't decide if I like it, but its main purpose was to provide a contrasting background for a white Hoosier cabinet (and a mess of art supplies) while not clashing too horribly with the stone and wood around the fireplace. Maybe I'll paint it purple in another few years. In the starting image for the news video above, the house behind the "play" arrow (with the little dormer window and the pile of branches on the roof) is where my friend Kathy lives in Louisville, KY. If you watch the video, you'll see a guy with a red shirt clearing the tree that fell on her house. Fortunately she and her family are fine, though the tree landed 12 inches from her son's head! Oh, yeah, there's an annoying ad at the start of the video - of course. 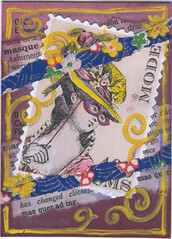 This past week's Make It Monday's theme was Masks and I knew I wanted to make an ATC using one of the "Mode" faux postage stamps from Ten Two Studios with these big haired, big hatted 18th century fashion models. But getting a mask on her was not as easy as I had planned. I originally wanted to cut out a little paper mask, but after the several tries, the best of which made her look like she went to the same optometrist as Geordi LaForge, I decided I would have to draw her mask and hand (hence the goofy fingers :o). I still had my dictionaries lying around from last month's By Definition trade with Milwaukee ATC, so I found definitions of "masque" and "masquerade" to glue on the background, which is one of the many paint chip ATC backs I cut from all the paint samples I found while cleaning out my collage stash.